Okay, not really. But one of the drawbacks of living in the country is that come every fall, little critters want to move in. They see you all toasty and warm and with a pantry packed with goodies, and they think they should waltz over the threshold. This isn't the first fall that I've had a mouse move into one of our vehicles. Unfortunately. You'd think they wouldn't be able to get into cars. But mice are sneaky. I guess I'd rather have a mouse than a snake, or a tarantula. This mouse snuck in when we were in West Virginia. Those WV mice are total opportunists. While we were unloading gear to our cabin, doors wide open in the minivan, the mouse saw his chance and took it. The next morning I found a pack of orange snack crackers open on the floor, scattered about. Paul doubted me when I said it was a mouse. But then I pointed out the droppings. It took 3 different mouse traps. That's right THREE. This is one smart mouse folks. Don't let anyone tell you that WV mice are dumb. This mouse repeatedly stole snacks from the traps I set without getting hurt. It was a glue trap that got him in the end. And so I spent my Friday afternoon thoroughly cleaning the minivan. And I found his stash. Just under the stroller. Little nesty down in the crevice. Can you spot it? Ah, yes, a close up. Is that a french fry in there? Gag. Oh, and a spider man sticker too. Thank goodness for vacuum attachments, right? And look, a paper clip! I guess the mouse was setting up office. Truly I hope the WV mouse was single. I hope he didn't bring his family on in when he made his move. 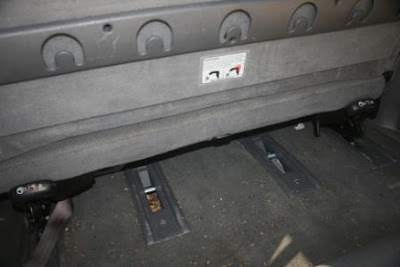 But just in case, there's a couple of glue traps with poptarts baited along the corners of the minivan. In the meantime....Paul found a roll of paper towels chewed up in his car. Guess he'll be setting some traps too. I had no idea they would get into vehicles like that. Glad you got him in the end and hope you don't find anymore! I hope he was single too. Mice are not my favorite. yikes.....I'm a chicken and mice....double yuck. We do the mouse wars every fall too but have never had them in the trucks! I hope you catch them quick! I know that mice and rats and I suppose other things too can get in the car. You are brave woman! We have and are trying to catch our 4 attic squirrel and we have flashing around the roof. Glad you caught your uninvited commuter. 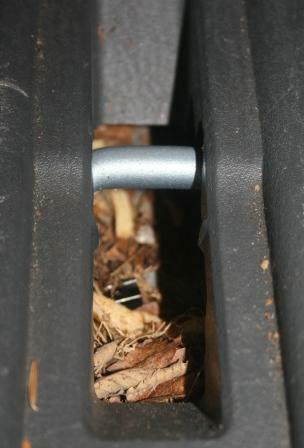 I pull the seats out of our family vehicle periodically and am amazed at what I find--no mice yet thank goodness. second time recently i heard a mouse in a minivan story. we get them in our garage, the glue traps always work best but many times they get the food and we don't get them!! This is so funny! Yep, it happens all the time and I thank God for my dogs and cats; they take care of rodent problems. Ugh! MICE! Such nasty creatures. Yikes! I have worried about a mouse getting in my truck because of all the food that my kids leave in there but so far I haven't had that problem. Lucky me! lol Years ago my husband's car had a hole in the floor and furry critters would get in there. He quit letting us ride with him in his car until he finally broke down and bought a new car when it was to the point the car just couldn't be fixed anymore! I will say that I do keep decon in my garage hidden in corners away from the dogs being able to get into it. Maybe that helps? Girl! A couple years ago I had a mouse crawl up in my dashboard and made a nest, like overnight. When I started the car in the the morning, I heard thud, thud, thud like my heater/ac fan was shorting out. Then the noise stopped so I went on to work. When I got off, no noise. A couple days later, my car was RANK. It gagged me it stunk so bad. So I cleaned and cleaned. Still smelling. Then I saw some torn up tissue by my dash. Rambob took my dash off and found a chopped up, dead mouse. he had made a nest in my fan and when I turned the car on, I chopped him up. GROSS! So, now in the fall we throw mothballs under the cars where we park (we park outside)and never had a moments problem. By the mothballs break down/wash away winter is here and no mice are running about. Ha---I've never heard of that before... AND--for them to get into TWO cars, wow--that's amazing... Glad you captured that smart MOUSE... AND--I'm glad they didn't get in your house or into your suitcases... Yipes!!! glad you caught him at the end. That mouse is like a genius! I can't imagine a mouse in my car but you're so right, I'd rather deal with a mouse than a snake or spider, eeeek!! We do battle with them every year! And they are smart little suckers. They have been able to remove the food without setting off the traps! We also have a problem with voles also coming in! I was alright until you mentioned the TARANTULA!! And the glue traps freak me out. I don't know why, maybe seeing a mouse who was stuck on there practically dance around our kitchen back in PA. Freaked me out. You are GOOD at being a detective, I wouldn't have realized the signs, and you did good in finding his nest, too!! Guess you have had experience! I've never seen a mouse nest before, this is most enjoyable! It is actually quite cunning and cute. I have never heard of a glue trap before. I totally hate mice!!! I have a feeder that I have out that only little animals can get into. I give them poison..... hate to do it but these things carry disease. Good gosh! My thinking is that there was just too much mischief for one mouse. My mom has mouse troubles in her basement. Seems like the glue traps are the only things that work. lol I posted a mouse story today too. My mom was worried everyone was going to think she didn't keep house, but that's just the way of things in the country. Oh dear mercy! In the vehicle?? I had no idea. We are having a problem with spiders, crickets and katydids getting into the garage, then into the house from there. I think I will set some mouse traps in the garage, just in case they decide to try to move in. I've never heard of a car invasion. That little jerk! I just posted on Facebook this afternoon that I was putting traps out in my house. I saw droppings in a kitchen drawer and I'm not having it. Trapping is well underway! Anyway, just wanted to say thank you for leaving me a lovely comment on my guest post over at Jdaniel4's. Appreciate that! I just set traps with cookie crumbs on them....worked last year and now I have no takers. Go figure! Glue traps work most of the time while the other ones are hit and miss. I hate tossing out the glued mouse, however - makes me feel guilty! We've had mice pop up and out at us when we open the riding mower engine cover - that is frightening!!! The hubbs has levitated more than once when that happens!!! Good luck! May I suggest a good cat? I'm impressed with your mouse. He's a risk taker...or at least was. I've never heard of a mouse living in a car. It's too bad he can't enjoy his cozy little french fried home any more. Rest in peace. We visited some friends way out in the country once, and as we were pulling into our garage when we got home-a little whiskered face popped up outside the windshield. He'd hitchhiked into town with us! I guess that country mouse was ready to try city living for awhile:) He ran off, never to be seen again. I thought he'd at least send a postcard and let us know how he was doing! Growing up in Indiana we would get mice moving in when they would harvest. The problem I have with mice in Arizona is they fall into my pool trying to get a drink of water and drown. Every morning before I leave for work I check my pool for dead mice. I don't want them in there all day! In both vehicles?! Yikes. I had never heard of that before. Better disinfect really well. These things can get in the smallest nooks and crannies. We have lived here 4 years and have as yet to see a mouse.... well, except for the ones that kept rebuilding their nest in Hubby's grill on the back deck... Do Not Like Those Creatures!